GS LI Terminal Diffusers are ideal for pharmaceutical companies, manufacturers of medical devices and companies in highly regulated industries. The GS LI series feature a gel channel on the upstream side of the final filter which provides a leak-free seal between the filter and the housing. 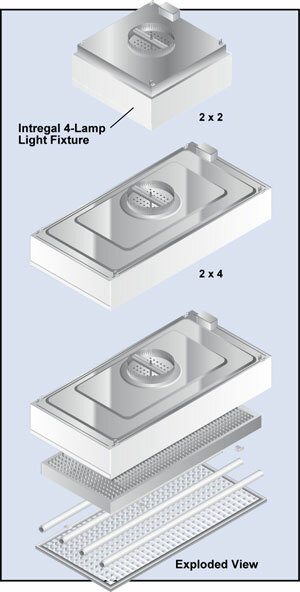 GS LI Terminal Diffusers feature an integral “flow-thru” 4-lamp light fixture and a HEPA or ULPA filter replaceable from roomside. An acrylic eggcrate grille in an anodized aluminum frame is hinged to open, permitting removal of the HEPA or ULPA filter without removing the complete unit from the ceiling. Final filters are protected with a white epoxy diamond grille and are tested according to accepted procedures as described by the Institute of Environmental Sciences (IEST) and/or ISO standards. The standard HEPA filter is 99.99% eff. and an ULPA grade 99.9995% eff. filter is available as an option. The integral light fixture and T8 mulit-voltage electronic ballast is located inside the filter housing below the final HEPA filter. This permits fluorescent light bulbs or ballast to be replaced easily. A junction box is located on top of the unit for easy connection to the building power system. Access Port: This port is located in the center of the filter element face and is used for introducing an upstream challenge or measuring static pressure. 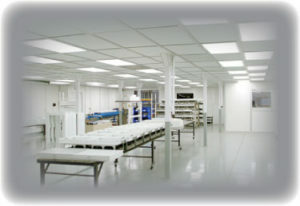 Lights: Integral 4-lamp Light Fixture with T8 Electronic Multi-Voltage Ballast. Fluorescent light tubes are not included. Options: ULPA Filter and thermal insulation. 11108 2 x 2 20.62 x 20.62 x 3 10 99.99% @ 0.3 120V to 277V 35 lbs. 11109 2 x 2 20.62 x 20.62 x 3 12 99.99% @ 0.3 120V to 277V 35 lbs. 11110 2 x 4 20.62 x 44.62 x 3 10 99.99% @ 0.3 120V to 277V 70 lbs. 11111 2 x 4 20.62 x 44.62 x 3 12 99.99% @ 0.3 120V to 277V 70 lbs.